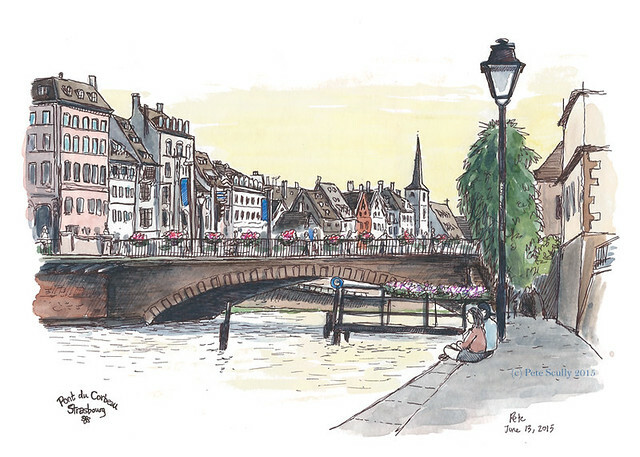 I don’t think I’ll be putting these Strasbourg sketches on my sketchblog in chronological order necessarily, but perhaps thematically. ‘Down by the River Ill’, which is the theme for this post, will overlap with at least a couple of other posts, but c’est comme ça. There’s a lot of river in Strasbourg (unlike Aix, which doesn’t have one). The centre of Strasbourg is built around the river Ill, primarily on a big island in the river (the ‘Grande-Île’, or ‘Big island’). The Ill meanders into the great Rhine river, which flows by many of Strasbourg’s western suburbs and provides the border with Germany. Strasbourg by the river Ill is very pretty, and a popular place for people to sit on the embankments and just relax, and read. Or sketch! The church above, however, I sketched from a tram stop located on one of the bridges. This is the Eglise St. Paul, which dominates the spot where the river Ill is joined by the short river Aar. The Eglise St. Paul was built in the 1890s, when Strasbourg was part of the German Reich (in the territory of Elsass-Lothringen, or Alsace-Lorraine). The bridge is the Pont d’Auvergne. This second sketch was done earlier in the day, while sat on Quai Finkwiller next to the Pont St. Thomas, on rue Martin Luther. I had just spent a couple of hours sketching a wildly detailed scene in Petite France, and was on my way to sketch the Cathedral. The pink flowers were beautiful against the green railings of the bridge. Below me, a man fished with his long line. 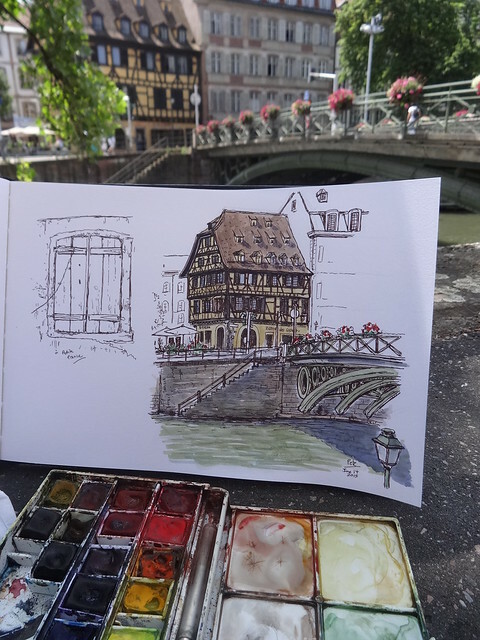 I met one other urban sketcher while drawing this, Rene Fijten from the Netherlands. I had met him the evening before at the Urban Sketchers France meetup, having followed his amazing work for years, and it was an absolute pleasure to finally meet him in person. I found him sketching nearby a little while later. If you don’t know his work, you really should check out his sketchblog. 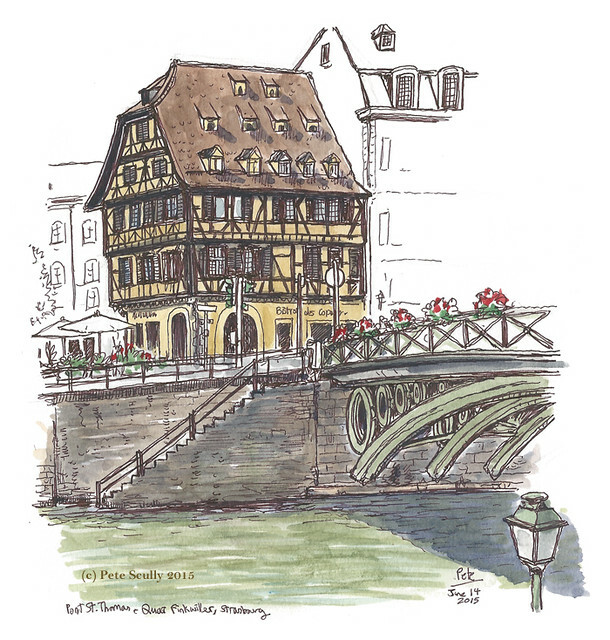 This final sketch was made down by the Pont du Corbeau, at the end of a long first day sketching Strasbourg. I was on my way to meet up with the French urban sketchers at the Cafe Atlantico, further up the river, and found this stretch of the Ill too sketchable to resist. I could spend days just sketching along the river. I never did do my two-page river panorama (I did give it a go), but I might save that for a future trip. Wonderful sketches as always. The architecture is really interesting so I’m sure you found scenes to sketch at every turn. Thanks! Yes, literally every turn was a sketchable scene in Strasbourg. 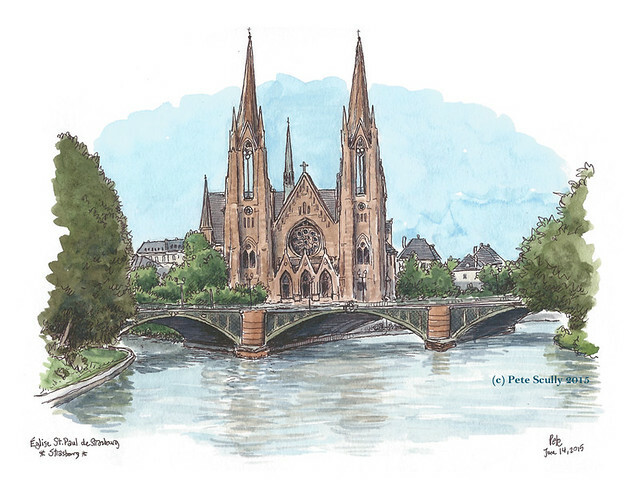 I love Strasbourg and I think you captured the essence of this wonderful city. Thanks! Strasbourg really is lovely.